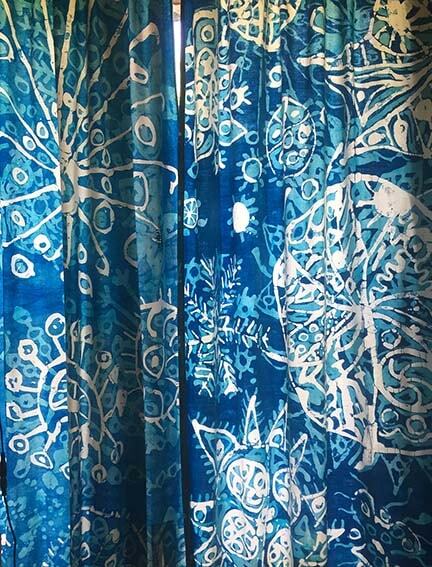 My first ever piece of Batik, these curtains were made for my mum's sunny kitchen window when I was just fourteen. I worked on them on the floor of my parent's attic room, dripping wax from a lit candle, in a bent sellotape tin, held with a pair of pliers! It taught me to be very positive to decide where I wanted the wax to go, as it dripped relentlessly on to the cloth. Life is much easier these days with my thermostatic electric wax pot and tjanting. The curtains, mended many times, were hung in every house my parents lived in, till my mum died in 2010. When my daughters and I were clearing her house, I nearly chucked them out saying "we don't want these old things do we". Luckily, both girls protested loudly - and I'm so glad they did - and the curtains were saved.